A heavy punch of fog in the lightest frame. 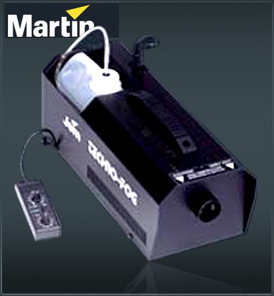 The Martin Magnum 800 is the perfect fogger for small nightclubs, mobile DJs and bands. Compact and lightweight, the Martin Magnum 800 effortlessly punches out a full, dense fog which is why it’s appreciated the world over as the industry workhorse. This reliable yet compact smoke machine is capable of delivering a non-stop intense cover of fog for instant atmosphere generation. With the Techno fog the days of compromising quality for price are over. Jem hand-held remotes are safe, user friendly, low voltage remotes which offer precision auto-timer and output level controls. The auto-timer is simple to set with ´Fog On´ adjustable between 0 and 15 seconds, while the delay period is pre-set at 1 minute. Once the reliable timer is engaged you are free to concentrate on the music.